Once we cleared customs and were able to take down our Q (Quarantine) Flag we stayed at the Marina Hacienda del Mar in Cancun for 3 days. It was a nice marina, mainly for sportfishing boats. We got laundry done, tidied the boat, and made two trips to Wal*Mart. Yes, there is not one, but three in Cancun. One of the things I wanted to buy was a pressure cooker and found one for $35. Once we got it home, we found that the weight and none of the seals were in the box. So the next day we went back, with no explanation for why no one gave them to us when we purchased it. The next day we fueled up and with help from everyone in the marina we were able to get away from the pier fighting 20+ winds against us. After all the time in the rivers, Scott sure does know what his boat can do. Just an hour later we were anchored in Bahia de IdM, very near the Procyon or as others call it the “Rust Bucket. (RB)” The boat has been left here for at least 5 years, so everyone knows where we are when we say we are near the RB. On our last day at sea we had a Mexican Navy boat (Marina Rescate) come very near us and shine a light on us. They were looking for a medical emergency that they where taking ashore. The captain of the ship was very surprised to have a boat come out instead of a helicopter. By the picture you can see that they do have a helicopter. We watched them practicing many times in the bay. We were blessed with many beautiful sunsets at anchor here. We were delighted to hear that our friend, Karen, made plans to come and visit while we are here in IdM. Here tickets were for the middle of April, so..what a great place for another extended stay. The first few weeks we were surprised by all the wind, 20s and above and cold fronts that passed through. We were only able to go ashore about once a week due to the winds and the holding in the anchorage. The bottom is grass and sand for about a foot and then limestone below that. So your anchor never really sets very well. It would slowly drag and when it filled the anchor flukes with grass it would finally let go. The anchor would come up with an ice cream scoop of grass and sand. Almost every change in wind would cause a boat to drag. During one of the norther storms we were not too excited when a boat pulled in and anchored this close to us. We sat out the storm on watch in case we would have to start the engine and get out of their way. You can also see on the graph from our wind meter how we were sitting at no wind, had a gust of 36 and a change of direction of 180 degrees right over our anchor, and back down to no wind again seven hours later. What a great place to be for spring break! Everyday, boats of all kinds pass by us here in the bay: from people ferries to car ferries, yachts to sportfishers, sailboats to catamarans, and dinghies to kayaks. Speaking of kayaks, we were finally able to blow up and use Cindy’s birthday present from last year. We got it blown up, in the water, and Scott tied it by the bow. As we got everything else ready to go: water, sunscreen, cushions, and paddles. When we looked over the side, the boat was gone. Yes, that is Scott swimming back to the boat with the kayak. We have had a few days of great paddling, snorkelling, and sailing around the island. Going ashore on IdM is a lot of fun. On the island, the Mayan Goddess of fertility Ixchel, was honoured with many statues. Thus when the Spanish Expediation of 1517 landed here, they called it Isla de Mujeres, the island of women. The island is 4,3 miles long and 2,130 feet wide. There are lots of wonderful restaurants with the only chain type being a 7-11 store. The most popular way around the island is by renting one of the 500 golf carts, 1500 mopeds, or 120 taxis. There is a turtle hatchery, Dolphin Discovery, Garrafon Beach Amusement Park, ruins, cliffs and gorgeous white sand beaches. Here are pictures of some of our favorite sights. April 11 is our Metaversary. That’s right, 20 years ago Robin introduced us to each other on a blind date to Bennigan’s. We spent the day feeling like tourists by going to the Cancun’s Hotel Zone and celebrating at Jimmy Buffet’s Magaritaville Restaurant. Karen is here, John is here, Charles is here, Dave and Debbie are here! The next 10 days were spent spending time with friends from Texas. First John, Jerry and Robert arrived on Dragonet from Panama. We had last seen John and Diana on the Mighty Mississippi just north of St. Louis. Dragonet used to be our neighbor on F Dock in Marina del Sol and were one of the first to leave and go cruising. Yeah, Karen is here and she is on our boat and safely ensconced in her stateroom. Many thanks to Dragonet for letting us borrow their inflatable dinghy or we never would have gotten Karen’s suitcase to the boat, all 57 pounds worth, filled with goodies for the Amazing Grace. 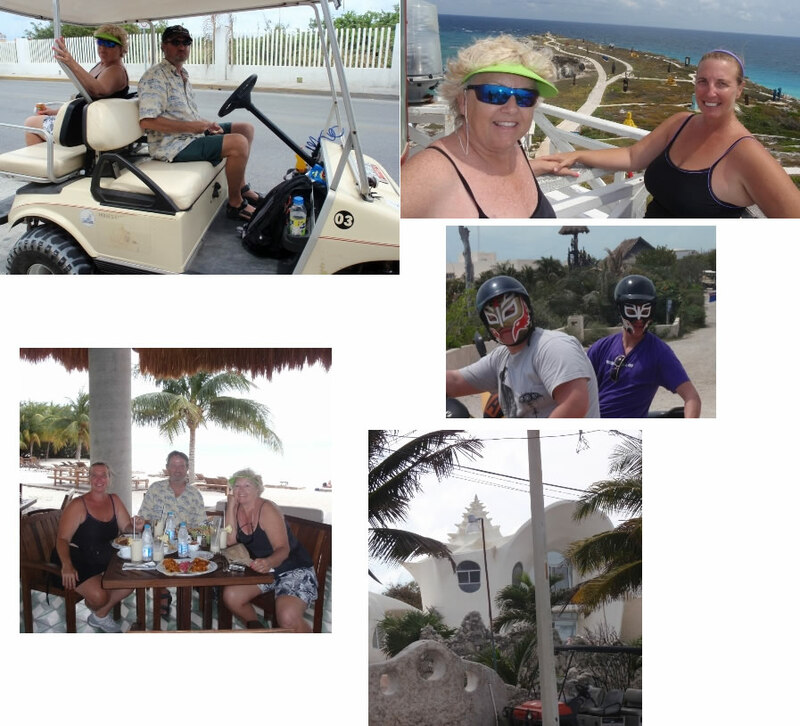 Karen’s Second Day: we did the IdM tourist thing and rented golf cart for 24 hours and toured the island. Five minutes after returning the golf cart on Karen’s Third Day, the clouds opened up and the monsoons hit. Scott ventured off down the flooded streets to get back and keep the boat safe. Karen and I then proceeded to go shopping and restaurant hop eating appetizers and drinking umbrella drinks. We had to do something waiting for the weather to clear so Scott could come back and get us. IdM 20 Here we are with the fashion of the island or as our provider called them Mexican life preservers. After a rough night on the Amazing Grace, Scott got a break in the weather and took Karen off to the ferry dock on Karen’s Fourth Day so she could return home to Seabrook, TX. We were a little sad as we restored everything back in Karen’s stateroom. Right after renting the golf cart we were driving down the main street next to the beach and Cindy yells and points, “Hey, Charles!” Scott whips the cart into a u-turn and Cindy jumps off to say Hi. Charles has a machine shop in League City and he has machined many things for Aztec. Cindy met Charles when he came aboard the Amazing Grace for a return trip to Houston from Port Aransas after the 2001 Harvest Moon Race. Long story short, he didn’t even spend the night aboard because engine problems delayed us in Rockport and he had to arrange another ride. Charles and his wife Carol Anne vacation in Isla a few times a year. After 3 days of rain we caught up with them again and got a picture with John, Diana, and Dave the crew from Dragonet for the return trip to Texas. Next, Dragonet will go to Missouri by truck for it’s new home in Portage des Sioux. When Scott had made it to the boat during the monsoon, on the radio we had the next friend from Texas encounter. “Hey Amazing Grace, are you the one from Texas? Do you kiteboard at Texas City Dike?” Well, you know, when it rains it pours. ;) Affirmative. We know Dave from kite boarding and he is one of the captains of the Kemah, Beast. We finally got to meet his wife Debbie, a retired school teacher, and their dog Foxy on Wind Dancer. Our favorite Cocteleria right next to the Port Captian’s dock. Lobster, YUM! A few days later another dinghy pulled along side. “Hey, aren’t you the guy that works for a bolting service in League City and used to have your boat at Watergate?” Yep, that is us. Steve and Ed were returning to Kemah with Sails Call, a boat Steve bought in Panama. Small world again and they are also friends with Dragonet. We spent a many enjoyable times with our friends in the cockpit, pizza runs in the dinghy, at Milagro Marina movie nights, potlucks at Marina Paraiso, happy hour on Wet Bar and for meals ashore at many of the marvellous restaurants. The week-end before Karen got here we were shocked when our brand new water maker quit working. For $3,000 we expected more than 100 hours of use! This was not good. We had been at anchor for 5 weeks, running low on water, and having a guest arrive in two days. Scott troubleshot and figured out that the pump body had to be replaced because it wasn’t making enough pressure. So he quickly ordered the parts to be shipped to Diana on Dragonet back in Missouri. She carried down the new parts in her suitcase. A day later we were water rich. During the monsoons we heard a boat say that they were rain fairies, they had filled all their water tanks, and were giving it away. I turned to Scott, “Don’t we have rain collection hoses from our scuppers?” Sure do. An hour later we were filling our water tanks. Three hours later we were full up and he had the water maker repaired. Life is good when you have water! Now we will send the old water maker part back with Wind Dancer and hopefully we can get it fixed under warranty. Every morning there is a Cruisers Net for Isla on channel 13 at 8:30 a.m. Every day there are at least 20 people who check in and share information. Our favorite part is the Treasure of the Bilge section where people come on and buy, sell or trade their items. While we have been here we have seen at least 100 boats come in and head back out heading north and south. We find our selves going to books to try and figure out all the different flags. One boat that we were anchored next to for a couple of weeks was Lamal Lo from France. Since we didn’t speak each others language, we were able to communicate by speaking Spanish. Again, everyone has a different story. Some cruisers have been out for years, while others cruise just six months a year. Some leave their boats and fly back to their homes in the US and Canada, while others make the Gulf Crossing every year. We even got to see 25 boats finish the Regatta del Sol from St. Petersburg to Isla. All good things must come to an end in Paradise. Finally, a weather window arrived for all our new friends to head north. A flotilla of five boats headed for Galveston, another one, avoiding the oil slick for New Orleans, and half a dozen for Key West. We just heard from a crewmate, who completed the 2006 Veracruz Race with us, she is flying into Cancun Monday. ♪♫ So… under way again…we are heading south to hop down the coast of Mexico and Belize.